Risotto, risotto. It’s one of those things where it makes you go all mushy inside with a bite. One of the main reasons why restaurants charge for it so dearly is because it takes time to make risotto. It’s not a dish to make in advance, unless your intention is to use it to make arancini or risotto balls. It’s not a dish to make if you’re in a hurry. 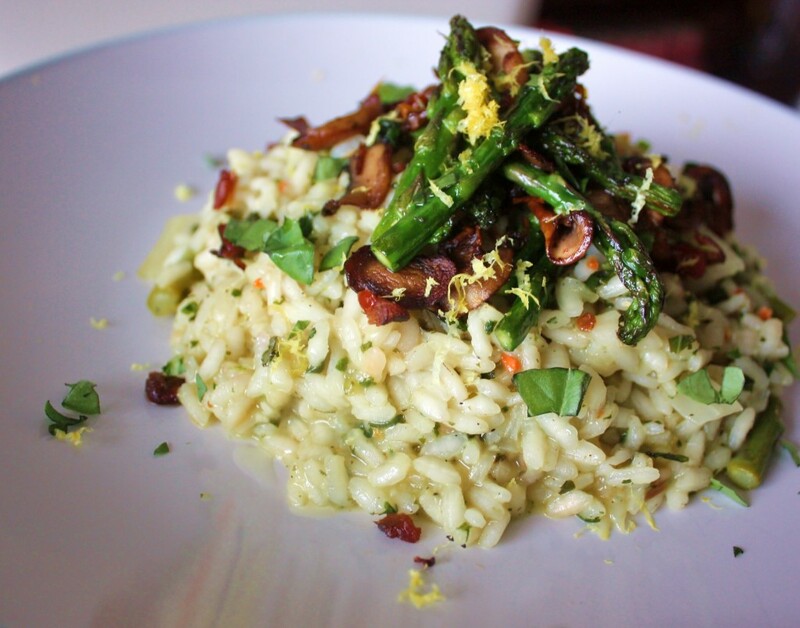 Risotto is a dish that is all about taking your time and using only the freshest ingredients – and then you reap your reward when you savor a mouthful of silk with a nice-bodied bite in each grain of rice. A properly cooked risotto is a delicacy. I had a pint of cremini mushrooms and a bunch of young asparagus bought from the farmer’s market. And I knew both these items were locally produced somewhere in Compton, QC. I don’t know about you but I find that vegetables/produce that has the shortest route from farm to market tastes so much better; the asparagus were amazing eaten raw. I swear I could have eaten all of it before I started cooking. But that didn’t happen, so it’s all good. The combination of mushrooms and asparagus is like umami-heaven. When you put them on top of a basil and garlic based white risotto, it’s like they were meant to be and you want to scream – OMG WHERE WERE YOU ALL MY LIFE? !